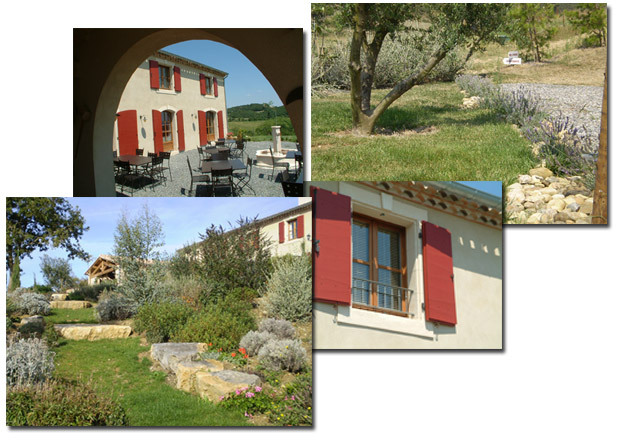 Domaine de la Goutine – Exceptional Gîte, holiday rental of outstanding vacation home, walking and horse riding holidays. Only 10 miles from the medieval city of Carcassonne and under7 miles from Limoux and its famous wineries for Blanquette de Limoux, the domain de la Goutine sits on the heights of the Malepère, in the foothills of the Pyrenees. Surrounded by oak forests, vines and garrigues, this massif is classed "Natura 2000" because of its authentic and unique flora and fauna. 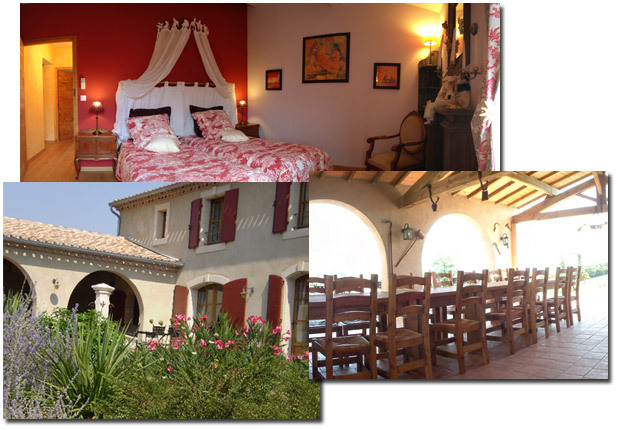 This imposing Languedoc style house overlooks its own park of 16 ha (approx. 40 acres) of essentially Mediterranean vegetation. The private swimming pool with its large terraces surrounded by palms, olive trees and parasol pines, was made for spending "idle" hours in the sun. This exceptional home can accomodate up to 17 people for family and friend gatherings. It has 7 bedrooms and 6 bathrooms, all individually decorated, a fully equipped professional kitchen, a dining room with a large open fire, a covered terrace with a barbecue and a bread oven and a billiards room. All to make your stay unforgettable. Against dramatic natural backdrops, you can explore the Cathar castles: Montségur, Lastours, Peyrepertus, Puivert... the ruins bearing witness of an era from the 12th to the 14th century. Do not forget the Canal du Midi, the XVII century work of P. Paul Riquet which is now classed as a UNESCO World Heritage Site (as is the Cité of Carcassonne). 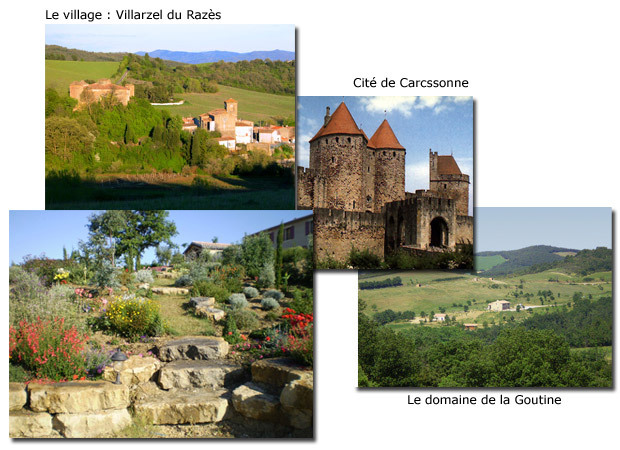 There are a number of Romanesque and Benedictine abbeys within easy reach: St Hilaire, Fontfroide, Lagrasse… museums in Limoux (Musée Petiet, the piano museum and the muse des automates) and the dinosaur exhibition in Espéraza. Your hosts, veritable ambassadors of their region, are here to help you discover the fantastic local produce like meat from the “Pays Cathare”, vegetables from their own garden and great wines from local producers: Blanquette de Limoux, Chardonnay, Côtes de Prouilhe, AOC Malepère, Minervois, Cabardès, Corbières. 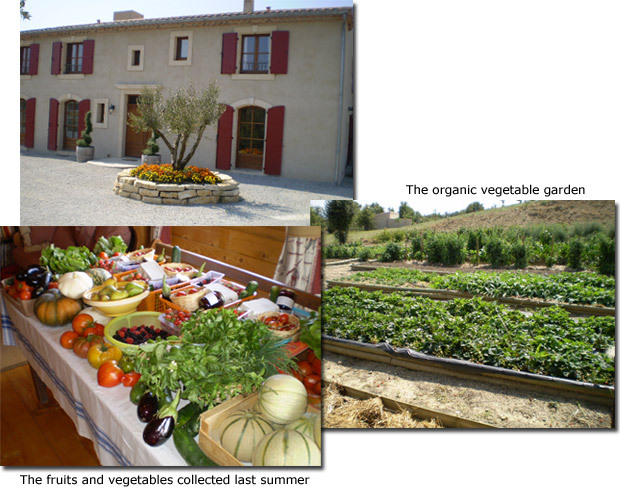 Le domaine de la Goutine is also an ecological garden! In 2013 we decided to create a market garden with fruits and vegetables, traditional ochards and unusual fruit bushes.....Trésors de Campagne was born!! This ecological, organic garden might be open for visits at some later stage! Le domaine de la Goutine is also a sportive stop-over! Lovers of untamed nature, vast plateaus, seductive scents and stone-splitting sunshine – treat yourselves to superb horse trek outings, walks or mountain biking. Horse riding tuition. The domain offers classes in horse riding, swimming in the private swimming pool, boules and a children's play area. We regret that animals are not admitted on the property.